Either If you play football or you watch football, it will make you hungry. Be it friendly match, minor league, European Football Championship or World Cup, watching will make your stomach growl. For a proper dish on nice football watching evenings we already recommended the summer food Knackwurst Salad. 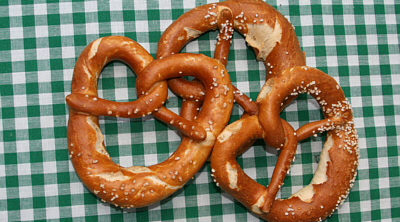 (click on the link to see the recipe) n between we will need some snacks, matching the football theme, calming nerves and healthy for the real sports people. Our recommendation for the perfect football party food: footballer crackers. 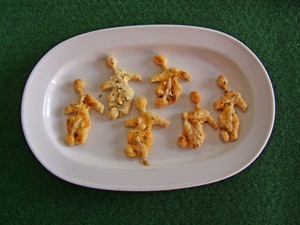 Footballers cut out of fluffy, flaky quark-dough finely herbed and seasoned, accompanied by a delicious dip. Regarding the amount of pastry you will want to make: using 300g dough (100g of every ingredient), you can make 30-45 football player. 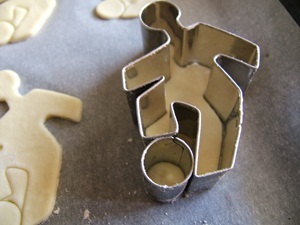 Alternatively you could use ready-made flaky pastry for your footballer crackers. 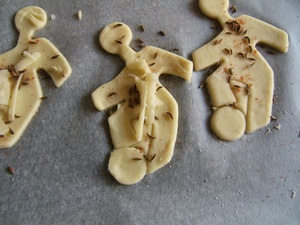 roll out the pastry, cut out the football players, put the cut out players onto the baking sheet. Once you have filled you baking sheet you can season your crackers as you like it. Put the footballers into the oven and leave 12-16min until crip. When you bake them for the first time check frequently to see when they start to darken. Ideally you fill another baking tin in the meantime. We recommend that you only use part of the pastry and leave the rest in the fridge (about a quarter for each tin). 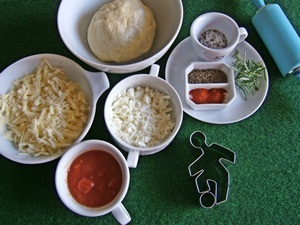 To accomapny the footballer fingerfood you can either serve them with a hot tomato salsa, or make one of the spreads in our recipe collection, like the quickly prepared dill quark spread. When watching football games you might like one of the teams more than the other, you can of course have in mind the colours of your team when preparing dips, snacks and finger food. The only thing we found difficult so far was to produce a healthy blue salty snack (we usually go for sweet snacks and use blueberries or bilberries). If you are watching euro cup, you might need colour combinations of flags. 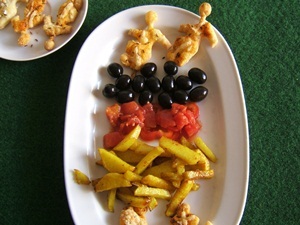 Fairly easy is the German flag: black olives or tapenade, red tomato sauce with red peppers and golden potato chips. For the golden-yellow chips: peel potatoes, cut them the size you like, put them into a baking pan, season with salt, 1 tea spoon full of curcuma (tumeric), add one table spoon of oil, mix all with the spoon. Bear in mind that curcuma will not only colour the potatoes. We just popped the baking pan into the oven while baking the footballer crackers and left potatoes inside until ready (30-45min). If your favourite team is Spain, you already have the two colours to swerve the Spanish flag when watching the football game. If your heart beats for Italy or Portugal there are many options as well. 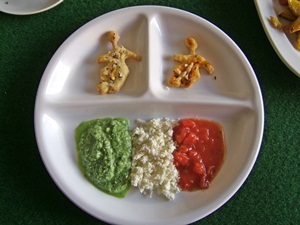 When we arranged the Italian flag we used our feta-cucumber-spread, feta and tomato sauce. To have a real green version of the cucumber spread we used an organic cucumber and left the peel on it and added a handful of rocket salad (you could as well use spinach, which is great for colouring green). Those who like it strong and intensively could use for the white colour Alioli – mayonnaise with garlic, if you make home made mayonnaise you can give it a strong yellow colour by using olive oil and several egg yolks – yellow is part of the Ukrainian flag. For all fans of Irish football: orange, is the colour of yummy pepper salsa, like the sweet-hot pepper sauce in our cookbook or ready made Ayvar. Have fun preparing footballer crackers and enjoy a great football game with friends. For those who have a culinary solution what to when you flags with blue and light-blue, we are eager to here that. Or should we just stick to blue paper towels?